← Momento Mori: Last Burst! Well, here we are again. I remember the first post I wrote here was titled “The Beginning Of The End”. So here goes. The end of the beginning. I don’t really know what I expected from this competition when I joined. When my friends asked me if I wanted to join with them, it was just, oh sounds cool, oh we probably won’t get far, but ah well why not? From there, it just escalated. It’s a miracle that we’re here, in the Top 10. We took this weird idea about a watch and we turned it into something workable. It still surprises me sometimes, the fact that we got this far. It went from just some random competition to one of the biggest events of my life. It’s amazing really, all the memories and the experiences I got from NEmation. After spending 3 weeks with some of my best friends in a tent, working tirelessly on a piece of work that is truly yours, that you’ve brought up right from the thinking of the idea right through to the completion of the video… all of it was amazing. It’s a dream come true really. I mean, how many people will get to spend three weeks just dedicated to making a short clip? We’ve been through so many ups and downs, from pitching problems to little arguments, from laughing our heads off because of suicidal watched to hiding each other’s toys. We’ve had so much fun in the process, and learnt so much. There are so many people to thank too. Our school, our teachers in charge, Mr K, whose pau kept us going; Mr James, though he isn’t with St Nicks anymore, and whose watch we broke; Mr Chan, who gave us life in Kinder Bueno; Mr Tham, whose bad jokes helped keep our spirits up. Our instructors, who have given their all to help us. 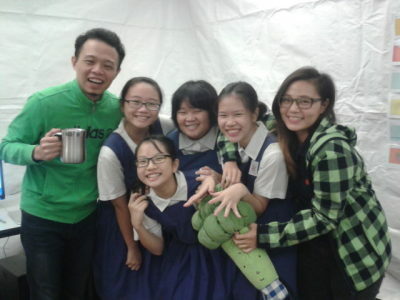 Ms Weilin, Ms Elaine, Ms Yanting, Ms Hazel, Mr Alvin, Mr Joshua, Mr Ellery… Everyone who helped us in those weeks. I really miss the freezing cold of the NYP computer labs, and the NYP Lounge that became our second home for the span of those three weeks. I’ll miss going in everyday, and the whole animating process. J complaining about how the Singapore skyline was the worst thing in the world, Clara groaning about the lost pivot points, Char agonizing about how the hands didn’t look like hands… All these little things made NEmation one of the best things in my life, and I am so, so, so glad that we got where we are, and have been able to do what we’ve all done. Even the times when we were tired and grumpy, or the times when we were slacking or playing the guitar, they’re all memories that I don’t think I’ll ever shake off, neither do I want to forget any of these little details. Though it was tiring and crazy, it was fun. As they say, all good things come to an end. This is one end that I never imagined would be so difficult to come to. I really don’t want it to end. But this is it. Voting closes today. Next Thursday will be the awards ceremony (where they’ll probably torture us again, with their trademark style of result announcement. ), and then that’s it. We’re thinking of going to watch lots of movies after that though, in hopes of maybe catching our clip before the movie heh heh. I’ll never be able to finish thanking the people I have to thank, never be able to really shut up about the whole NEmation experience because it was really all just… magical. I wouldn’t have had it any other way. So, thank you all who have supported us, and got us here to where we are. We aren’t really anything special, just four random girls with a misspelt name and a knack for puns. It’s you who made us special. So thank you, so much. And Clara does everything else. That’s us, Momento Mori, and this is the end of the beginning.